The following article was found on the 2+2 forums. The original post by Pokey is titled How to use PokerTracker and can be found here. 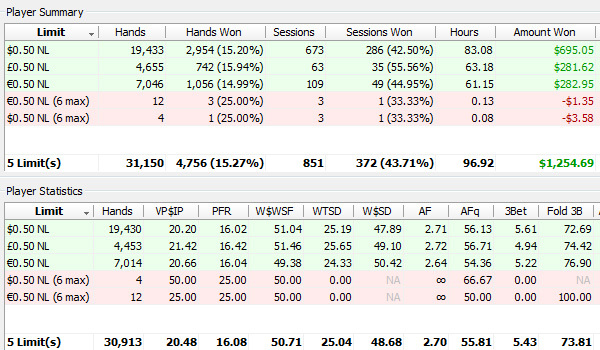 PokerTracker is software that records all of your hand histories and tells you information about how you play. You can use these statistics to spot holes in your game as Pokey points out. Even though he uses an older version in his examples, the newest version of PokerTracker uses the same stats even though some names have changed slightly. Analyzing your PokerTracker stats is a great way to find leaks in your game that you would of missed otherwise. With some slight adjustments to improve your stats, you can easily improve your win rate for all future sessions. This is a how-to post, but it doesn’t belong in the software forum; it’s to teach people how they can use the PokerTracker data to find flaws in their game. Not a week goes by that someone doesn’t ask if they are playing the game right. In that post, they include a dozen numbers from PokerTracker and hope that the old-timers on SSNL can fix all their holes. While it’s true that PokerTracker can help find problems, this is not the way to approach it. I’m going to try to give you a rough guide for the things you can do to check on your game. These are all just my opinion; they’re all subject to interpretation, and other people may disagree with me strongly. The best way to play is usually player-specific, but these strike me as some things you can check on that are frequent flaws in the small-stakes player’s game. 1. Do you have sufficient preflop aggression? To answer this question, open up your ring game statistics and go to the “position stats” page. For each position other than the small blind, divide the “PF Raise %” by the “Vol. Put $ In Pot.” If you get a number smaller than 0.5, you’re not aggressive enough out of that position. See, aggression is a relative term; it should be a function of your level of looseness. You can be a consistently winning player at SSNL with a VPIP of 12%, and you can be a consistently winning player at SSNL with a VPIP of 30%, but only if you are sufficiently aggressive. My general guideline is that you should raise at least half the hands you play, from every position on the table. Total all the dollars you’ve ever bet playing poker. The large majority of those dollars should have been bet from late position. Only a small percentage of your total handle should have been bet from up front. To test this, go to the Position Stats and look down the list of VPIP from Button to UTG. You should see that VPIP steadily dropping the farther you get from the button. I’d love to see my button VPIP at double my UTG VPIP, but if my Button VPIP is at least 50% larger than my UTG VPIP, I’m happy with the situation. 3. How’s my stealing? To check on your performance when trying a blind steal, go to the General Info tab. Where it says “Att. To Steal Blinds”, I’d like to see that number at LEAST 20%. (Personally, I like mine to be over 30%, but I’m very aggressive in these situations. If you’re trying to steal the blinds less than 20% of the time, you’re leaving lots of money on the table.) Now click on “Filters…” and under “Chance to Steal Blinds” click “Chance to Steal & Raised.” Select OK and look at the numbers. This shows every time you’ve tried to steal the blinds, and how the attempt turned out for you. Under “Totals” see the “BB/Hand” statistic. That shows your per-hand winrate on blind steals. If you multiply this number by 100, it should be at least double your “PTBB/100” average winrate. If it’s much less than that and you have a decent sample size, you have a hole in your game when it comes to blind stealing. This should be an exceedingly profitable thing to do when you try it; if it’s not, you need to work on your strategy. 4. Defending the blinds. Click on “Turn Filter Off,” and then click on “Filters…” again. Under “Blind Status” click on “Either Blind.” Now under “Vol. Put $ In Pot” click on “Put Money In.” This shows you if you’re bleeding money out of the blinds. A “BB/Hand” of about -0.375 would indicate that you were no better off putting money into the pot than if you had folded. If your “BB/Hand” is larger than that, then you typically win back some of your blind money when you put money into the pot from the blinds. That’s all you can really hope for. If you click on “Filters…” again and go under “Steal Attempted Against Your Blind” and click on “Steal Attempted.” After you click “OK” you’ll now see how you did when you chose to defend against a blind steal. Again, the magic number is for your “BB/Hand” to be bigger than -0.375; that means you’re making back some of your blinds when you try to defend against a steal. If either of these numbers is lower than -0.375, you’d lose less money by always folding rather than doing what you’re doing. 7. Pocket pairs. Under “Filters…” change the “Type of Hole Cards” to “Pairs.” This will show you how you generally play and perform with pocket pairs. Your Total VPIP with these should be EXTREMELY high; unless you play at highly unusual tables, I’d be surprised to see this number below 85%. Pocket pairs make extremely powerful hands that are extremely well-hidden; if you’re not playing them almost all the time, you’re leaving money on the table. Also, your Total PFR% with these hands should be rather high — at least 1/3 of your VPIP, if not 1/2. Some people have this number higher still, and I don’t have a problem with that, especially at short-handed tables. If you have enough hands, I’d expect every one of these lines to be positive, and reasonably significantly so. If you have any glaringly negative numbers, especially AA-88, it may indicate bad play. Look over individual hands where you lose lots of money and see if you played too timidly early in the hand, or if you went too far unimproved in the face of resistance. Also, look at the hands where you won to see if you played too timidly, or if you routinely forced weaker hands out when you should have been milking them for profits. All of this is just an introduction to the kinds of self-analysis you can/should do with PokerTracker statistics. Notice how much more in-depth it is than just glancing at a few VPIP numbers. Typically, the only person who can truly do a “check-up” on your playing style and ability is YOU. As always, if in your searching you find hands that indicate you may have a flaw in your poker reasoning, post them up (one at a time, of course). Tell us the problem you are worried you might have, and why you think this hand might indicate the problem. Then, open the discussion up to see if 2+2ers agree or disagree. 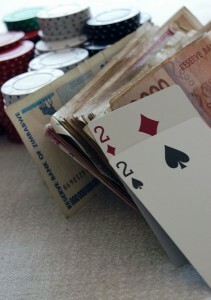 I’m sure you can see the benefits to using PokerTracker after reading this article. If you do not yet own the PokerTracker software to import your hand histories and analyze your statistics – you can now sign up for a free 60 day trial. You can use PokerTracker all you want for 60 days and then decide if it is worth purchasing or not. I personally purchased PokerTracker for $80 and have used it for 3-4 years now. I quickly earned my money back and would have never improved as quickly as I did without this software. I recommend that every online poker player uses some kind of tracking software and the 60 day free trial is a perfect reason to start using PokerTracker today. Edits for clarity or readability have been made.